The secret to wearing shorts to work is all in the length of inseam. When picking out a pair of shorts for work you don't want to go any shorter then a 6 inch inseam (for you taller ladies with legs for days you might want to look for longer length, 6 1/2 to 8 inches, I find that 6 inches works for my height 5'6"). Look towards brands that cater towards woman work wear like Loft, Ann Taylor, J.Crew and even brands like Zara that have lengthier shorts. Pair them up with a casual work wear top or printed tee, and always a pair of flats to low heel. Lucky for me, my office is a bit more casual then a lot of others. 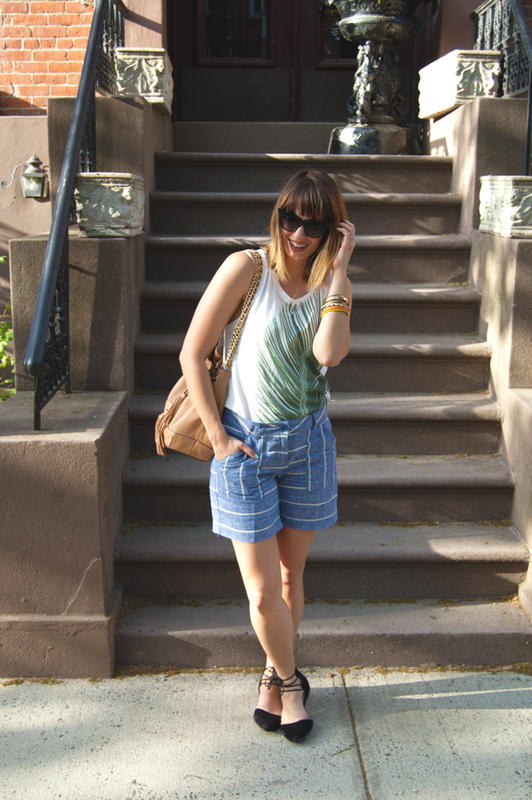 These chambray shorts from Loft (similar style here) totally gave me this resort vibe, so I felt like the only appropriate way to welcome the summer weather in was to pair it with a palm leaf graphic shirt. When doing a cutoff top always make sure your straps are thicker. Avoid spaghetti straps and low cut shirts as you don't want to bare to much skin in an office setting. Always keep in mind your office's dress code. If you don't know the dress code get in-touch with your HR Department or assume that nothing should be shorter then finger length above the knee. For longer length cuts, try Bermuda shorts (here, here, and here). Would you wear shorts to work? Definitely agree about spaghetti straps. Great recommendations.